John: Welcome to the CharacterStrong podcast where we have conversations on school culture and leadership. 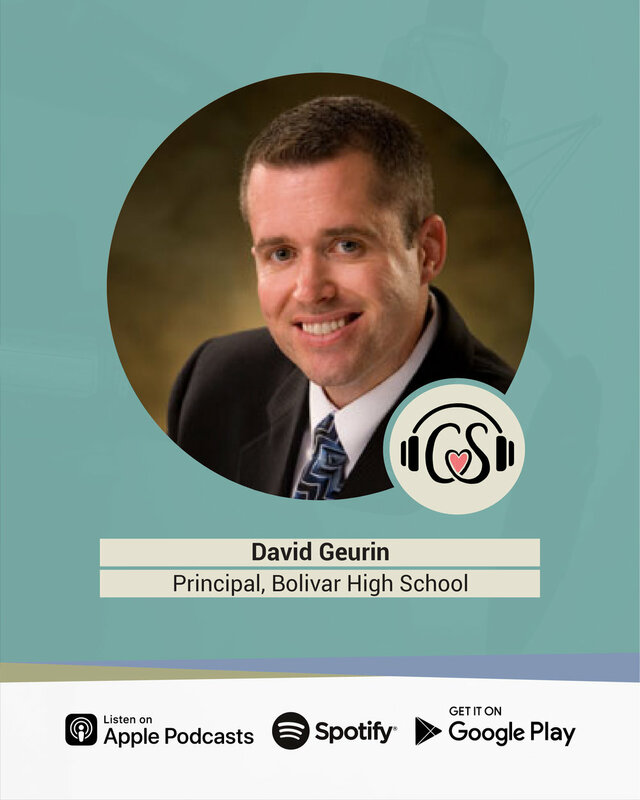 Today is part three of a five part series where we are talking with David Geurin principal of the Bolivar High School Liberators, a National Blue Ribbon School and Bolivar Missouri. He's the National Digital principal of the year, a speaker, and author of the book, future Driven Will Your Students Thrive In An Unpredictable World? Are you ready? Let's get CharacterStrong with David Geurin. David: To supporting the academic skills. Without those skills, the academic skills often fall flat and students who are stronger in their ability to manage their emotions and have character and do the right thing for the right reasons, they tend to do a lot better in the classroom academically also. It just totally makes sense, it's really one of those self evident truths isn't it? Not just it makes sense. John: Well, what I've learned too is it's not that people don't want to do it either in schools, it's just like a lot of times how do we do it? Which kind of then goes to when we were before talking about how important the systems are a piece but now kind of then getting down to like specifically talking like about these soft skills are becoming more valuable for the future. John: That technology can take over many tasks that were reserved for people in the past, but that human only traits will become even more valuable and essential as technology becomes even more integrated into every aspect of life that was number three in your blog. John: As a principal, what do you seeing? What are you seeing in today's youth? The teenagers that are coming through in regards to what is needed? Like what skills should we be even zeroing in on even more specifically and intentionally knowing that there's a lot of things that we could be going after when it comes to those skills? David: Absolutely. I always will champion for our kids, it's kind of normal for the older generation to complain about kids these days, and they have their challenges. But man, I love our kids, and I just see so much in them that is good, and we want to nurture that, but they do have challenges that we didn't have growing up a social media and, which I'm a champion for social media too, I believe that it can be very positive. David: But they are facing challenges with the smartphone, and the devices there's a lot of evidence that shows that it's contributing to anxiety and depression and things like that. We're seeing ... I was having a discussion yesterday with someone about just how much more anxiety and depression we see now than we did and how much we see of resilient skills, and the ability to persevere some of those things I think have suffered also. David: I think some of the smartphone generation, the things they faced have contributed to that. But at the same time I always caution that doesn't mean we just like fight technology or ban technology because that's not the world we live in either. David: It's how can we create healthy conditions where students can learn better to manage the challenges that they face and be able to have the resilience and the face to face ability, the ability to communicate with peers. David: And with authority figures and just communicate well in a world that seems to be more of a text, short not much connection kind of world. We're probably more connected than we've ever been and yet we're less connected than we've ever been how about that? Isn't that true? It just seems crazy. John: So true, so true well said absolutely. I think Dr. Tim Elmore once said, it's like we need to be timely and timeless. It's like we need to be timely and understanding how do we help students navigate and I would say we need to have more empathy for our students. John: It's exactly what you were saying, like even when I was in high school, and I don't think that I'm in the big picture of that old, but at least if I had a stable home and identifying that not all students do. John: But if I had at least a stable home when I was in high school and I was dealing with something socially that wasn't easy to deal with or struggling in some way on the relational aspect. At least when I went home it didn't follow me there but now it follows our students 24 hours a day. John: When we think about then like, “Well you know, kids these days.” You'll hear that line and it's like, “Well how about adults these days?” Because adults struggle with the social media side as well. And yet we're the ones being called to lead young people when it comes to how are we learning to use these most effectively. John: It's a really interesting dynamic of this being timely, how do we work within the current technology age and yet also timeless, which is what are those timeless principles, character traits, leadership pieces that we know on the relational side have always been important and will always be important because of that connection level, the idea that we were built to be relational. David: Yes, yes. We were built to be relational, and I completely agree. I think as technology maybe present some of those two challenges, it's also just a challenge to us to make sure as educators that we are helping equip students to be able to navigate the technology and also just navigate life in a increasingly digital world and soft skills are a part of that. David: It's really not just about digital citizenship, it's about citizenship in today's world. Citizenship in today's world includes being a good digital citizen and understanding what's healthy for me to be able to make healthy decisions. We want to help kids to have those discussions and have those thoughts about their future, and the choices that they're making. John: Well said. Well, thank you. I feel like in every one of these topics that we've been having this week, I could just talk to you about for an hour on each individual one, but I think that's a good pause point and then what we'll do is tomorrow we'll continue. John: We're going to talk about that idea, number four, and you're five considerations that number four says that your character is more important than compliance. Too many schools are focused on simply getting kids to comply. John: I want to talk to you about that as we get into tomorrow and dig in more on that piece that we're seeing so many times in schools. Thanks for being with us David, and we'll see you on the flip side tomorrow. John: Thank you for listening to the CharacterStrong podcast. If you enjoyed this episode, feel free to share on your social media. Please rate review and make sure to subscribe for future episodes on Spotify and iTunes. Thanks for listening, make it a great day.